We are pleased to introduce Privilege Membership for our valued regular customers. 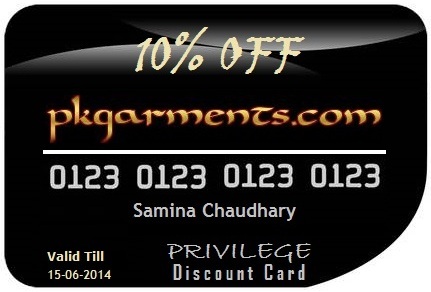 Become a privilege member and enjoy a year of 10% savings on every purchase from pkgarments.com. This card is not for a one time off whereas you can get 10% discount on all the purchase you make for 1 complete year. If you are not a privilege member then you get 10% discount only when you purchase 25+ suits. So take advantage of this offer now and enjoy shopping of latest arrivals with no any quantity limit. How to apply for Privilege Membership? 1) Click on “ORDER NOW” button below and write “1” in Quantity field and “Privilege Card” in Product Link Field. 2) Then fill rest of the fields of the form and click Submit. 3) Wait for the instructions by email which you will receive soon. Privilege Member Discount is not available on purchase from Party Wear and Bridal Wear Collection. Privilege Member Discount is not available on shipment charges. Privilege Member Discount is not available on already discounted products & sale offers.